The Nature of the Stroller’s Handles – They ought to be the adjustable type to enable parents or caretakers of different heights to use the stroller equally comfortably. It would thus be illogical to settle on a stroller that is less adjustable if you are a couple with a great disparity in heights. The Ease of Using It – Having a cumbersome umbrella stroller will be a great undoing to you. Ensure that you settle on one that offers smooth movement and more preferably choose a stroller that can be handled with one hand. The Sun Shade It Provides – Choose a stroller that will provide your kid with sufficient protection from scorching sun rays as well as rain. Size of the Stroller – As much as you want to protect your kid from the sun’s rays, ensure that you settle on a product that will be easy to handle in terms of storage space and portability. How Easy It is to Fold It – It will be prudent to pick an umbrella stroller that can be folded with ease. If you can do this using one hand, then that product will be even better. The Reason for Purchase and the Frequency of Use – Different people have various reasons for acquiring a stroller and so do you. It will be good if you settle on one that is more appropriate for your specific use. For instance, in case you are interested in one that is suitable for shopping, picking a stroller with enough storage space will be prudent. On the other hand, if you will be using it more frequently, which applies to many of us, settle on a product that is sturdy and durable in nature. Add on Features (Cup Holders, Storage Baskets) – The presence of these additional features is convenient and will help with meeting your various needs. the storage baskets will aid you in lessening the burden of what you plan on taking along with you. The Stroller’s Design – It is good to pick on something that is baby friendly, a colorful one with great aesthetic value will do. The fabric used in making it should also be durable and sturdy. 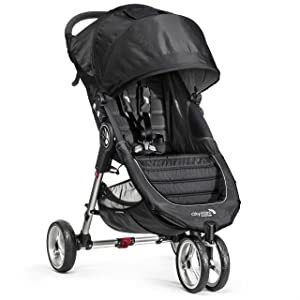 The Cost of the Umbrella Stroller – As much as you would want everything to be in a given stroller, its affordability should be considered to ensure that you get a good value for your money. Now that we have looked at factors that make a good stroller, how about we feature what is available on the market and pick the best stroller. The Baby-Zen Yoyo has nice wheels that provide easy maneuverability, along with some additional features that give it an edge over some other umbrella baby strollers. 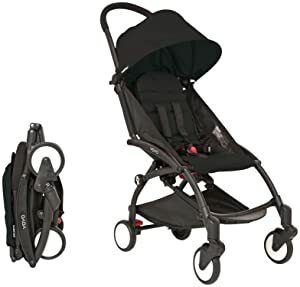 Designed using good quality material in a stylish way, this lightweight stroller can be folded into thirds for you to easily pack it up in a car trunk. The umbrella shade it provides is sizeable enough to protect your baby from scorching sunshine as well as rain and it’s quite appropriate for an urban dweller. It is however, not great for use over long durations and at times it won’t give your baby comfort while napping. You will also have to dig deeper into your pocket though you will get a good value for your money. This stroller is easy to use with remarkable maneuverability and its quality is desirable. The Quinny Yezz is a lightweight and foldable stroller which is fun to use thanks to its astounding turning radius as well as the one finger push capability. It has skate-like wheels together with closed baring besides having a comfortable seat and a small canopy. This umbrella stroller also has a pouch at the back, to carry a few items like an extra diaper, or a baby bottle. It can be folded up into a smaller form, allowing you to carry it along hands-free or easily store it at any location. The stroller however, has very few features and doesn’t have the reclining option, which may make the baby uncomfortable during prolonged periods of use. It is what most of the traveling parents would desire due to its convenience. The Recaro Easylife stands out for being a budget friendly but quality stroller which is pretty easy to use. This umbrella stroller has a nice tri-fold design that makes it foldable enough to fit into small spaces; it also has a strap that will enable you to easily carry it along. its canopy is relatively sizeable with a peek-a-boo window, a storage bin, and an option for comfortable reclining for better napping. You will however experience some difficulty while trying to maneuver it in areas which have uneven terrain as it can be stressful to push and steer it on these. The Britax B-Agile is quite easy to use having the desired maneuverability. What is striking about it is that it’s lighter than most of the lightweight umbrella strollers besides being pretty easy to fold. It is also car seat compatible which makes it very convenient. With this stroller you will enjoy having a large storage bin besides having a good reclining ability to ensure the baby’s comfort. The canopy of the B-Agile is sizeable enough and this stroller is capable of tight space turning. 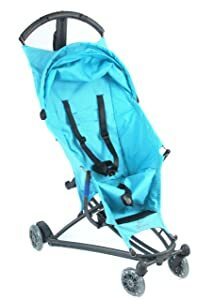 Despite the fact that this stroller is foldable, it folds into a large and bulky piece, and is quite heavy which makes it difficult to travel with. This stroller is easy to push and veer, making it an ace in maneuverability. It also has a large canopy, meaning the baby will be sheltered in the outdoors and folds in one quick and easy step. The Baby Jogger City mini has all that you need to have for most if not all trips you will have to make carrying a stroller along. Its reclining function will ensure that your baby is comfortable while napping. There is a storage bin and what is more is that it’s compatible with infant car seats. The fact that it is a two-in-on type of product means that if you can get your hands on an appropriate infant car seat, then you will end up saving extra bucks. It is however very bulky and heavy, meaning it can be quite cumbersome to carry. This stroller has a large UV canopy ensuring the baby is well sheltered. It also has a cup-holder and a large carrier pocket at the back. It has a near flat recline that can be used even with newborn babies. It is unique in that it has a peek-a-boo window that allows the parent to keep a close eye on the baby. 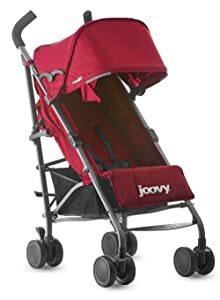 The Joovy stroller also features a useful zipper pocket. It is however very heavy and bulky making it difficult to carry along. Additionally its harness is not appropriate for younger passengers and its maneuverability is relatively low compared to others in this list. The Inglesina Net is a lightweight stroller that is made using good quality material with an easy to fold feature. It has two reclining positions ensuring the baby’s comfort though this recline is limited. This is a more hip stroller in appearance compared to its counterparts in the market. The stroller has a removable and washable seat cover, a shoulder strap to carry it, a cup-holder and a large carry pocket. You will benefit from this stroller’s under seat bin that could store a couple of things as you move around. A long trip and frequent use will take a toll on this umbrella stroller but it is pocket friendly and quite appropriate for travel. The Maclaren Triumph is a good pick due to its lightweight design and long lasting nature coupled with an array of other desirable features. 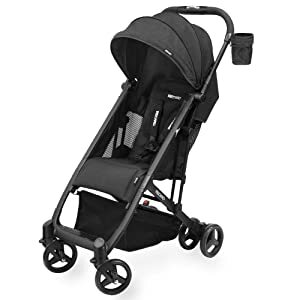 This stroller has an almost flat recline making it suitable for newborns; it also has a canopy and a decent sized carrier basket. You will also enjoy its comfortable foam handles while pushing your baby and its hood is waterproof, quite handy during a rainy day. It comes with a carrier strap making it easy to transport. The issue of concern is that its buckle system requires some level of skill to undo its harness, but it is generally a good pick. Be on the lookout for recalls and ensure that you don’t buy a stroller that has been recalled. Choosing a stroller can be a daunting experience, but it is worth the time and effort in ensuring one gets a worthy purchase. Their impact on everyday ease of use or versatility is really great. 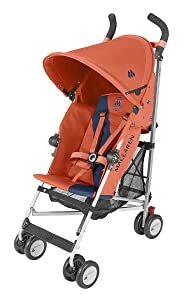 I hope this article has shed some light on what to consider before picking an umbrella stroller that is suitable for your needs, regards! 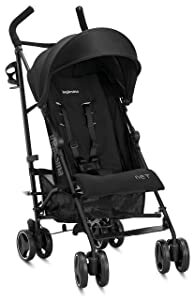 The Recaro umbrella stroller is a great choice! We love the quality and easy maneuverability. great collection of jogging strollers, I really like the layout of your website. very easy to search the jogging stroller according to customer needs. Thank you for your post. I will regularly visit your website! Umbrella strollers are the best during the spring and summer seasons. This article gave me a little more information than I already knew and I really enjoyed the Add-on features. Add-ons come in handy when your umbrella stroller doesn’t have the basket at the bottom. My favorite umbrella stroller that they discussed would have to be the Baby Jogger City Mini Stroller. I really like to do a lot of walking and it would be perfect.